Coastal North Carolina is endowed with some of the finest wildlife viewing and bird watching opportunities in the country. It's diverse climate and geography makes habitats for a wide variety of animal species. In addition, the state and federal governments have set aside nearly 40 refuges and wilderness areas along the coast as wildlife sanctuaries. The southern barrier islands are subtropical in climate and many tropical species such as brown pelicans and alligators make their homes here. Bald Head Island is the state's largest nesting site for loggerhead sea turtles. In summer months, the bald Head Island Conservancy leads nighttime vigils at the nests to watch sea turtles hatch. The Cape Fear River islands near Southport serve as breeding grounds for the state's largest colony of wading birds, such as herons, ibises, and egrets. Access to these islands is via boat from the Southport waterfront. Here birdwatchers will find brown pelicans and large numbers of terns and gulls. At nearby Fort Fisher, the North Carolina Aquarium features an intimate look at indigenous marine life, as well as a self-guided nature trail and several field trips in the summer months. Carolina Beach State Park and Mansonboro Island are also prime wildlife viewing locations. The State Park is a good location for possibly seeing an alligator, while Mansonboro Island Reserve is a designated national estuarine reserve. Further north, Hammocks Beach State Park is a pristine maritime environment, home to many species of reptiles, birds, fish, and mammals. Deer, raccoons, osprey, pelicans, and loggerhead turtles inhabit this thriving island, while a wide variety of aquatic life can be found in the marshes and tidal flats. On Bogue Banks, the Theodore Roosevelt Natural Area is the remnant of a lush maritime forest and contains natural habitats once prevalent over most of the island. includes a number of low tidal islands inhabited by a herd of feral horses and 200 species of birds. offers weekend programs, and the National Park Service maintains a visitor center near the Cape. The barrier islands north of Cape Lookout are part of the Cape Hatteras National Seashore, which extends from Ocracoke Village northward to Nags Head. Within the Seashore, visitors will find a variety of ecosystems and the most extensive range of animal species on the coast. The combination of the cold arctic waters north of Cape Hatteras and the warm waters of the Gulf Stream in the south makes for a diverse ecosystem. The Seashore is famous for its great concentration of migratory birds on the Atlantic Flyway. Nearly 400 species of birds have been sighted within the Parks boundaries and adjacent waters. Bird watching is best during the spring and fall migrations. In Buxton Woods at Cape Point, visitors can explore the largest surviving maritime forest in North Carolina. Hawks are especially predominant here, and a variety of fresh-water reptiles such as yellow-bellied sliders can be found in the freshwater ponds. At Pea Island National Wildlife Refuge on northern Hatteras Island, birdwatchers are treated to a spectacular array of over 300 species of migrating birds. Platforms and dike trails dot the refuge, offering prime viewing of raptors, owls, snow geese, herons, and many rare birds. At the Bodie Island Lighthouse just north of Oregon Inlet, nature trails meander through a diverse maritime environment, from sound to the open beach. Jockey's Ridge State Park in Nags Head is the site of the tallest and most active sand dune on the east coast. The bare dune, shrub thickets, and surrounding woods are rich wildlife habitats, home to fox, deer, rabbits, and many species of birds. A few miles north, Nags Head Woods is a stark contrast to the wind-whipped dunes of Jockey's Ride. Here, visitors will find a spectacular assemblage of maritime forests, relict sand dunes, freshwater ponds, pine-covered hammocks, and a great variety of animal life. This treasured Nature Preserve is a must-see for any environmentally concerned individuals. Currituck Banks is a twenty-two mile stretch of some of the most diverse, protected habitats for migratory waterfowl in the country. Many hunt clubs were built here in the late 19th century to take advantage of the abundance of geese, ducks, and swans. The banks are famous for the large concentration of winter snow geese and tundra swans. Nearby Mackay Island National Wildlife Refuge in Currituck Sound has had wintering populations of 50,000 snow geese and 4,000 tundra swans. Wildlife lovers will also find plenty of viewing opportunities inland from the barrier islands. Nearly 25 National Wildlife Refuges, Game Lands, and State Parks have been designated in the coastal plain areas, featuring pine forests, cypress bogs, and freshwater rivers, lakes, and sounds. The Great Dismal Swamp National Wildlife Refuge on the Virginia border features 25,000 acres of one of the largest protected areas of swamp wilderness in the United States. The Alligator River National Wildlife Refuge in mainland Dare and Hyde Counties is one of the last untouched coastal wilderness areas in the country. Thanks to a reintroduction program, the Refuge is home once again to the red wolf, a species that was nearly extinct ten years ago. Lake Mattamuskeet National Wildlife Refuge is another popular wintering place for Canadian geese and ducks. Native legend has it that the lake, which is the largest in the state, was created when a great fire burned a crater in the earth, which later filled with water. Nearby Pettigrew State Park and Pocosin Lakes National Wildlife Refuge are also prime wildlife viewing locations, especially by canoe. Along the Pamlico River, Swan Quarter National Wildlife Refuge and Goose Creek State Park are examples of untouched wetland environments. The marshes and sandy bottomlands are easily explored by boat and foot, which are home to alligator, deer, ducks, and birds of many species. Between New Bern and Morehead City, the Croatan National Forest contains some of the largest and best examples of pocosins-freshwater wetlands formed on deep peat deposits. Within the pocosin bogs are a number of freshwater lakes. The Forest is home to black bear, alligator, and many bird species. East of Morehead is the Cedar Island National Wildlife Refuge. Comprised of vast marshes and low sandy islets that jut into the Pamlico Sound, the Refuge is best explored by guided horseback tours, which can be arranged through private companies at the ferry landing. Sedimentary cliffs that tower 90 feet over the Neuse River dominate Cliffs of the Neuse State Park near Seven Springs. Here visitor will find a wide variety of coastal plain mammals and birds, such as deer, raccoon, foxes, river otters, bald eagles, and hawks. Waccamaw Lake near Whiteville if the largest of the Carolina Bay Lakes, which are geologic anomalies found only in this part of the country. The State Park features walking trails and boardwalks that border the lake and public boat ramps. Nearby, the Green Swamp Preserve is home to the Venus flytrap, a carnivorous plant indigenous to southeastern North Carolina. Bladen Lakes and nearby Jones Lake State Park encompass nearly 3,000 acres of Carolina bays and surrounding pine forest. Pitcher plants, endangered red-cockaded woodpeckers, bobcat, and black bear are common here. From the fresh waters of the rivers and estuaries, to the brackish expanse of the sounds and the depths of the Atlantic Ocean off coastal North Carolina is an angler's dream. Federal government studies reveal that chances of catching fish in North Carolina waters are the best on the East Coast. Of the 21 recorded catches of Blue Marlin in excess of 1,000 pounds, five have been off the North Carolina coast. The all-tackle world's record bluefish (at 31 pounds, 12 ounces) was caught off Hatteras in 1972. Need we say more? Big game fish are cool. But the best thing about North Carolina is the variety of fishing options. Enough, in fact, that if you had a week' vacation, you could engage in a different type of fishing every single day. So let's go! Monday: Go get your freshwater fishing license from the North Carolina Wildlife Resources Commission and head out for a day of river angling on the Cape Fear River near Wilmington. If you like, you can drop your line in at the River Road Park pier. Or rent a small powerboat for a day of trolling. Either way, you'll likely catch a few crappie or largemouth bass, catfish, and maybe some trout. Tuesday: Grab your salt water rod and head up to Bogue Banks for an evening of pier fishing, one of the most popular types of fishing on the coast. 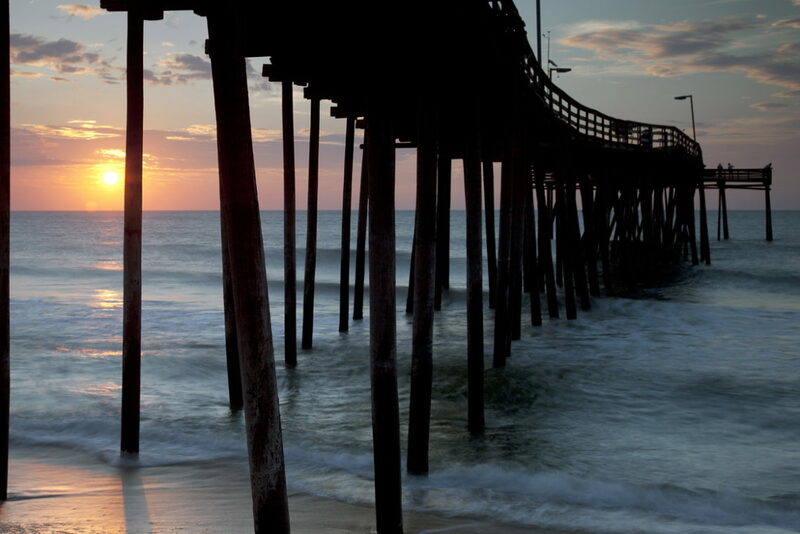 Nine of North Carolina's 29 ocean piers jut into the Atlantic from Bogue Banks. For a small fee, you can drop a line over and fish the breaker line for flounder. Or stake out a spot at the end of the pier for king mackerel. All piers sell bait, and many rent rod, reel and tackle. Wednesday: Take the Ferry over to Hatteras Island for a day of surf fishing at Cape Point, one of the most popular spots for surf fishermen in the world. On a busy day, you'll be lucky to find a parking space on the sand for your four-wheel drive (which is the only way to get there). But it's worth it! Here the Gulf Stream and the cold Labrador Current come together, bring hundreds of species of fish with them: cobia, tarpon, Spanish mackerel, bluefish, croaker, spot. Or, if you're really lucky, you'll hit Cape Point when the red drum are biting. Thursday: Try your hand at saltwater fly-fishing, which is rapidly gaining popularity along the coast. Although it requires great skill, there are a number of guides who will take you out and share their passion for the sport with you. You can try your hand at it from the deck of small boat in the sounds or ocean, or from the beach. Friday: Board one of the many inshore headboat charters on Roanoke Island that ply the waters of Pamlico Sound. These inshore charters offer all the equipment and bait you need for about $25. Headboats generally accommodate about 50 people of all skill ranges, and the mates and captain are always ready to lend a helping hand. Catch as much as you can carry-and the variety of species will amaze you! The sounds are brimming with croaker, trout, sea mullet, flounder, and spot. Saturday: Board a headboat for some offshore fishing. These boats are generally the same as inshore charters, except they ply the shallow waters and wrecks just off the ocean beach. You'll have plenty of opportunity for catching bottom feeders, including black seabass, triggerfish, amberjack, grouper, and snapper. These headboats often hover just above the many wrecks and artificial reefs along the coast, where fish congregate to feed. Sunday: You and six of your friends charter one of the offshore boats and head 40 miles to sea to play with the big boys. It's well worth the full day cost when the bluefin are plentiful, or someone snags a marlin. One of the best locations for offshore charters is The Point 37 miles off the Outer Banks. It's proximity to the Continental Shelf and warm Gulf Stream make it one of the best locations on the world for dolphin, tuna, mako, snapper, and even blue marlin. And there you have it --a week of fishing in some of the best waters in the world! The Crystal Coast is renowned for its centuries of history and fascinating attractions, and new visitors will discover that when it comes to maritime heritage, all roads seemingly lead to Beaufort. Renowned as North Carolina’s third oldest town, with a long legacy of being a hopping port community, visitors will find an assortment of museums in the region that pay homage to this history, as well as the local ecosystems and culture that make this area distinctively unique.